Feature Facts: Smallest member of procyonid family (olingos, ringtails, coatis, and raccoons), weighing 0.8-1.3 kg (1.8-2.9 lb). Distinguished from the more southern cacomistle by having furry foot soles and longer, more rounded ears. Broadly distributed, from southern Mexico north to Kansas and west to California and Oregon. Nocturnal. Feeds primarily on insects and small mammals; also consumes birds, reptiles, fruits, and scavenged animals. Solitary individuals, meeting only to reproduce. © 2013-2019 San Diego Zoo Global. Population estimates updated Mar 2019. How to cite: North American Ringtail (Bassaricsus astutus) Fact Sheet. c2013-2019. San Diego (CA): San Diego Zoo Global; [accessed YYYY Mmm dd]. 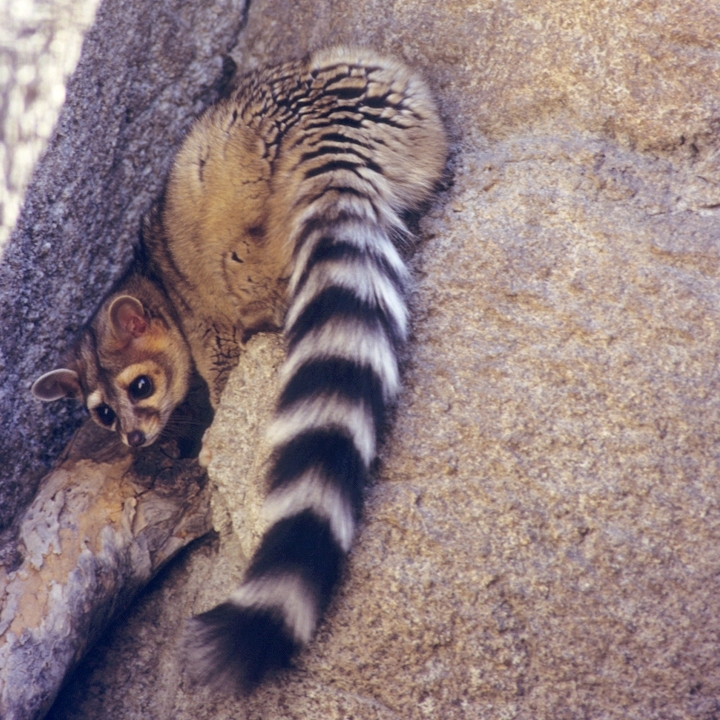 http://ielc.libguides.com/sdzg/factsheets/ ringtail. Many thanks to Scott Tremor for providing expert content review of this fact sheet. Scott is a mammalogist specializing in the mammals of southern California. He has worked with the San Diego Natural History Museum since 2004 overseeing biological inventories and conducting studies of regional wildlife. He is the principal editor of the San Diego County Mammal Atlas.